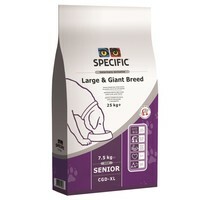 Specific Everyday Senior Large & Giant Breed CGD-XL Dry Food for Senior Dogs is a nutritional daily diet to support the health of older large breed dogs over 6 years of age, and giant breed dogs over 5 years of age. It has been made with a nutritionally balanced recipe that includes an increased level of fibre, to produce a slightly lower energy content. Therefore minimising the risk of obesity in dogs with a reduced energy requirement. Suitable for breeds over 25kg.